well as the adhesive compounds ORCON F/ORCON LINE and ECO COLL. For a permanent connection, the surface should be smooth, dry and stable. Surfaces should be clean and free from any loose materials, dust or sawdust (broom clean). Application of Tescon Primer RP is not possible on frozen surfaces. 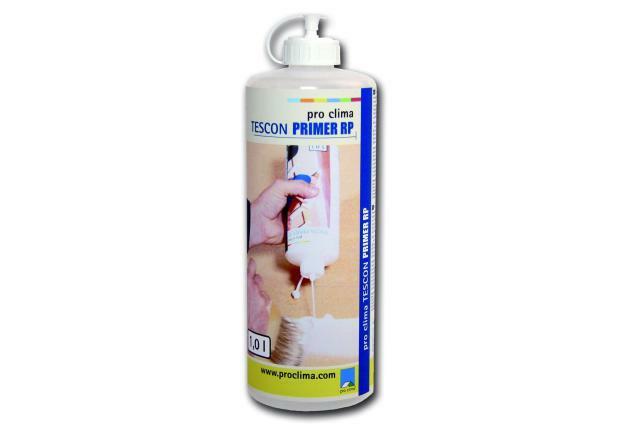 For speedy application no drying of primer is required, bonding to the wet primer is possible using Tescon No. 1 or Tescon Vana tapes. Deep penetration into the substrate. Suitable with all pro clima tapes & glues. I am interested in find out more about the product "pro clima Tescon Primer RP", could you please contact me.